Eileach an Naoimh, also known as Holy Isle, is an uninhabited island in the Inner Hebrides of the west coast of Scotland. 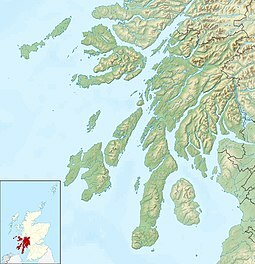 It is the southernmost of the Garvellachs archipelago and lies in the Firth of Lorne between Mull and Argyll. The name is Gaelic for "rocky place of the saint". About 542, St. Brendan the Navigator founded a monastery on Eilach, presumed to be the island, possibly because of the combination of its isolation and good grazing. Columba is believed to have visited the island and it is one of the proposed locations of the Columban retreat isle of Hinba. Eileach an Naoimh may be the burial site of Columba's mother Eithne. The monastery was destroyed by – or, at least, may have become excessively vulnerable to – Viking raiders, from about 800. The island has probably seen only intermittent occupation since, which has contributed to the survival of the ruins of many of the monastic buildings, including two chapels, beehive cells, and a graveyard with three crosses and another circular grave. The cells are contained in a pentagonal enclosure overlooking the rocky landing place on the south, which is guarded by various skerries. Beyond the enclosure there is another cell with two rooms. The oldest chapel is rectangular and may date from the 11th or 12th centuries. The monastic ruins are the oldest ecclesiastical buildings in Scotland and the site is in the care of Historic Scotland. If the ruins date from the time of Brendan this would potentially make them the oldest extant church buildings in Britain, although the earliest written record of their existence dates from the late 9th century. There is no ferry service, and transport to the island and its neighbours must be arranged privately. ^ Area and population ranks: there are c. 300 islands over 20 ha in extent and 93 permanently inhabited islands were listed in the 2011 census. ^ a b Haswell-Smith, Hamish (2004). The Scottish Islands. Edinburgh: Canongate. ISBN 978-1-84195-454-7. ^ Ordnance Survey. OS Maps Online (Map). 1:25,000. Leisure. Retrieved 21 August 2013. ^ Humphreys, Rob; Reid, Donald (2004). The Rough Guide to Scottish Highlands and Islands. Rough Guides. p. 113. ISBN 1-84353-269-7. Retrieved 2009-08-24. ^ Pallister, Marian (2005) Lost Argyll: Argyll's Lost Heritage. Edinburgh. Birlinn. Pages 120 and 133. ^ Marsden, John (1995) The Illustrated Life of Columba. Edinburgh. Floris Books page 110. ^ Pallister (2005) op cit pages 133-4. ^ "Eileach an Naoimh". Historic Scotland. Retrieved 13 Feb 2011. ^ "Jura National Scenic Area" (2010) (pdf) Extract from: The special qualities of the National Scenic Areas. SNH Commissioned Report No.374. Scottish Natural Heritage. Retrieved 13 Feb 2011. Wikimedia Commons has media related to Eileach an Naoimh. This page was last edited on 9 February 2019, at 19:06 (UTC).